I was priming some panels for next week and I realized that this subject would be good to cover here. Today, I will show a couple of methods of priming a panel with acrylic gesso and some paint, but what I demonstrate here can be applied to priming canvas as well. With so much already primed products available today you don't necessarily need to do it yourself, but there are some advantages when doing it yourself. That is, mainly, you have control over the final product. This not only allows you to prime the surface how you like, but it also allows more freedom in picking the type and size of the surface. You are not stuck with just what is available at the art stores. There are many ways to do this, but I will show you a couple of different methods. Let's prime a panel. 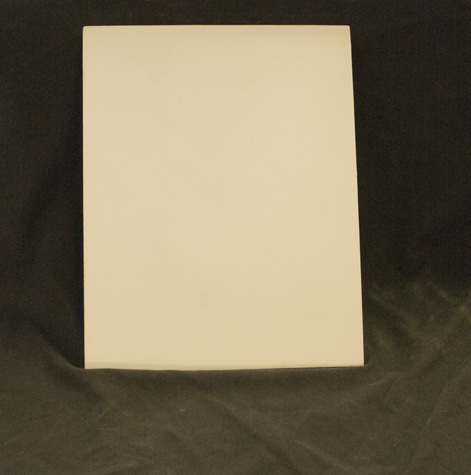 For these examples, I will be priming an 11 x 14 hardboard. 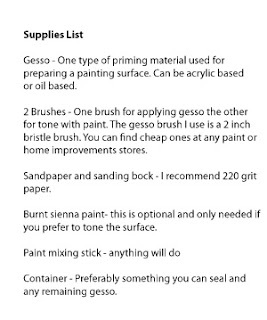 First, you will need a few supplies, gesso, a couple brushes, sandpaper (220 grit) and a sanding block, a container to mix the gesso, burnt sienna paint, and an oil medium. 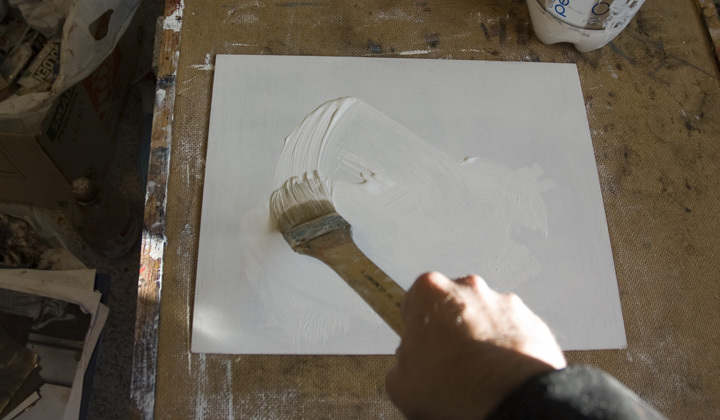 Next, apply the first layer of gesso to the panel with a brush. Let it dry thoroughly. 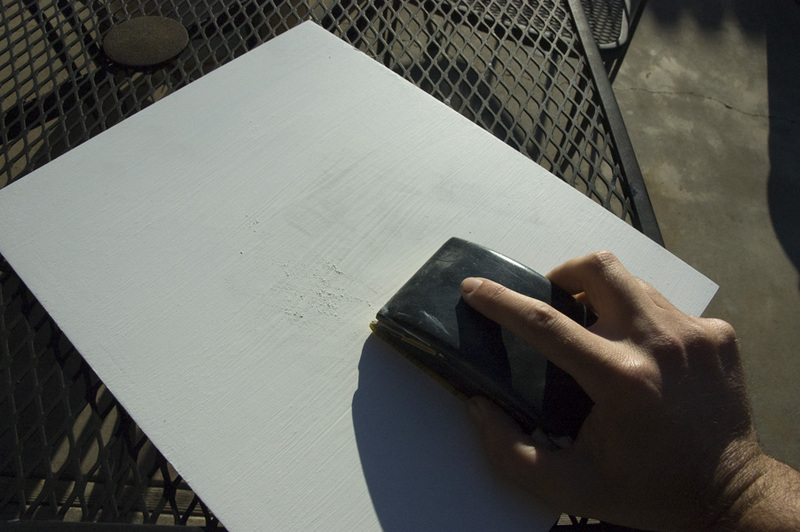 Then, using the sanding block, sand the surface smooth. Some people prefer a really smooth surface and some prefer a more textured surface. If you like the texture the brush leaves on your primed surface then no sanding is required. If you want to remove the texture, then sand to the smoothness you desire in between coats. Then repeat this process until you have a surface you a happy with. Without sanding three or four good layers should do. If sanding, more will be required. I did around ten or eleven in this demonstration. Some artists prefer to not work on a white surface and like to tone the canvas to darken the surface and maybe have some color. There are a couple of ways of of preparing a toned surface. 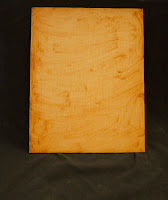 The first way is to prime the surface like mentioned above, then add the tone at the end. 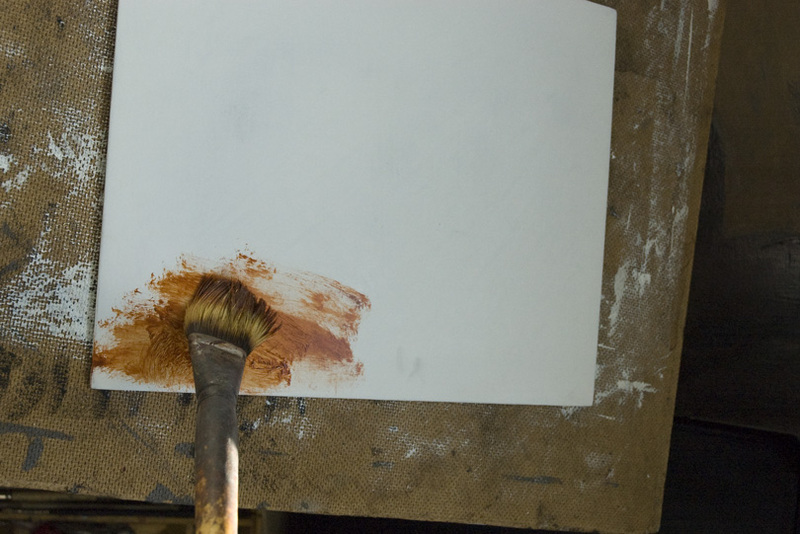 In this example, I will mix a little bit of burnt sienna oil paint with an oil medium. You do not have to use burnt sienna as your color choice, try out a few different paints and see which one you like best. Mix the paint with a little bit of medium. Then apply with a brush or a rag over the primed surface and let it dry. 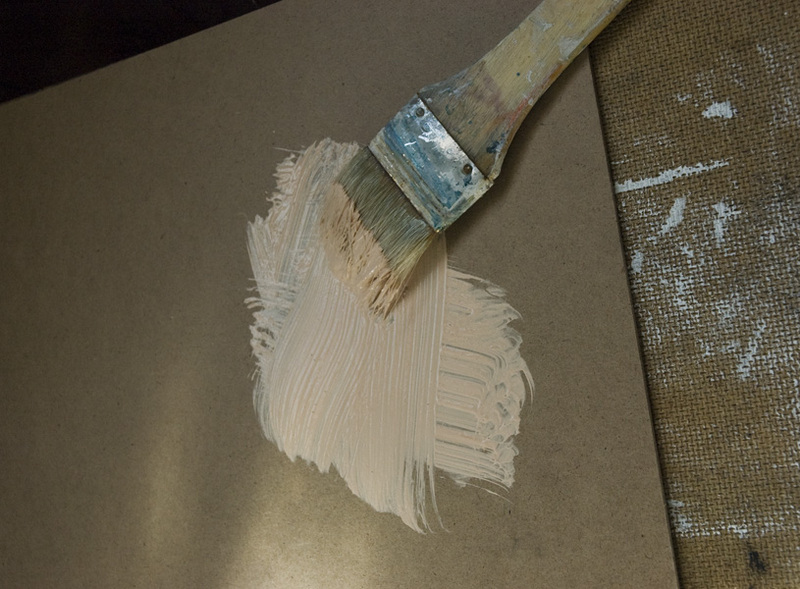 The other way to tone a surface is to mix the paint directly into the gesso. To do this, you will need the paint that matches the type of primer you use. 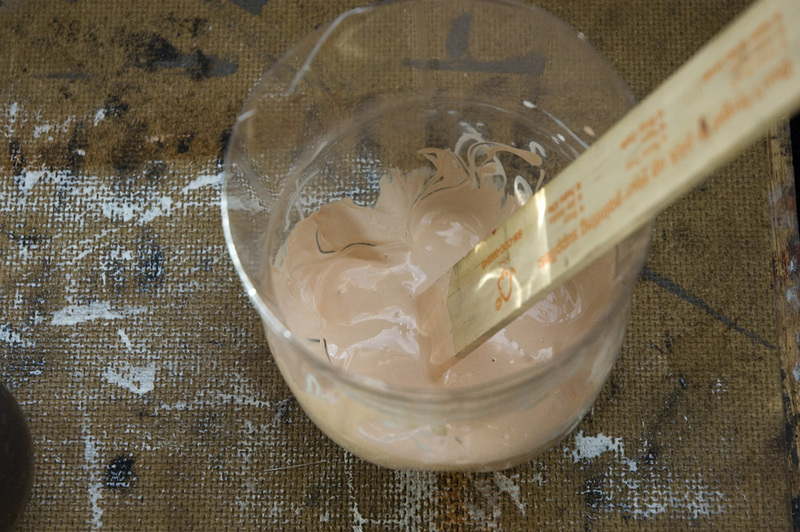 In this case, I am using an acrylic primer so I would add and acrylic burnt sienna paint to the gesso. Mix the paint into the gesso. 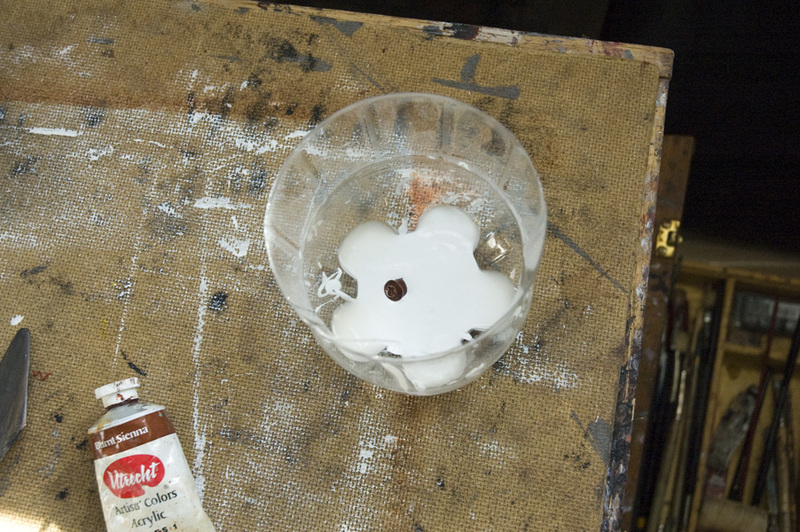 Then just like before, apply the gesso to the surface. Let the gesso dry and sand smooth. Repeat process until you have the desired result. 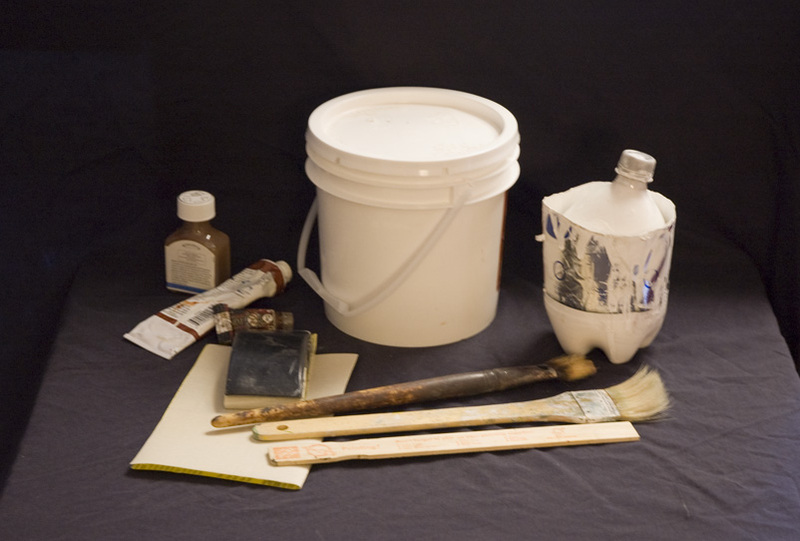 These are a couple of ways to prime a surface, there are plenty of other methods as well. Experiment with different methods until you find the method you like. Example of primed and toned panel, with texture showing. * Note: do not try to dilute oil based gesso and primers with water, all you will get is a mess.